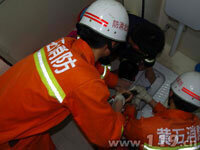 The glass breaker is the special rescue tool sets for breaking the glass effectively. It has been widely used in the rescue for public safety, firefighting, coalmine accident, petro chemistry industry accident and other emergency rescue. The glass breaker tool sets can achieve not only hard breaking operation by force but also breaking the glass slightly, which can achieve fast rescue and protect people trapped in cab, room and dangerous occasions from secondary injuries. 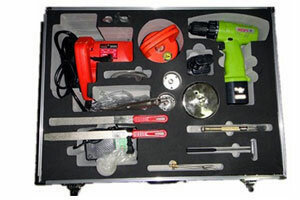 The glass breaker tool sets of our company can break many kinds of glass. There are mainly two categories of glass which are ordinary sheet glass and other kinds of glass. The other kinds of glass are including reinforced glass, frosted glass, sand blasted glass, patterned glass, wire glass, insulating glass, laminated glass, bullet-resistant glass, bent glass and glass bricks. The ordinary sheet glass can be divided into six kinds according to the thickness of the glass. The glass with the thickness of 3 to 4 mm is often used as the surface cover of the picture frame. The 5 to 6 mm-thicknesses glass is often used in the small light transmittance area such as window of outside wall and door leaf. The 7 to 9 mm-thickness glass is often applied for indoor modeling with large area and protection frame available such as the screen. The 9 to 10 mm-thickness glass can be employed in interior decoration such as large area partitioning and railing. The 11 to 12 mm-thickness glass is often used as the floor spring glass door and the partitioning in the environment with large flow of people. The glass with the thickness more than 15 mm is rare in the market. It often needs to be booked in advance. This kind of glass is often used as floor spring glass door with large area and entire external glass wall. Description Application: The glass breaker tool sets could be used by the police station, fire fighting department, mine industry and petrochemical industry to break all kinds of glasses for the rescuing work. 1. This tool sets can break the glasses with different materials to rescue the person in cab or trapped in the room or dangerous situation. 2. The tool sets can provide the outside breaking force and slight crush so that the rescued persons could not undergo a second injury. Application: The glass breaker tool sets can break ordinary flat glasses and other glasses including toughened glass, frosted glass, polycrystalline glass, figured glass, wired glass, bulletproof glass, glass block and so on. 1. Please check the saw blade for cracks, deformation and damage carefully before operating. If there is any problem, please change new saw blade. 2. Please be careful to not damage the rotation axis, bolt or flange, especially the mounting surface of the flange. If these components are damaged, it would cause damage to the saw blade. 3. The operator should hold the handle tightly to avoid the tool hurt the body. Don't touch the rotating parts with hand and you can put down the tool only after it stops running completely. Any external force to make the saw blade stop running is not allowed. 4. Before cutting the glass, the glass breaking tool can start operating with the glass only when its rotating speed comes to the maximum speed. You can't start the tool when it is contacting with the glass. 5. Please stop operating when you feel the vibration abnormal and hear the abnormal noise. 6. The glass breaking tool must be operated with the protection cover available. 7. If you need to change the new saw blade, adjust the cutting depth or carry out the maintenance, the power should be turned off first and make sure the saw blade is stationary completely. 8. The condition that removing the control trigger away and taking the power plug as control station would make the operator work with great danger. 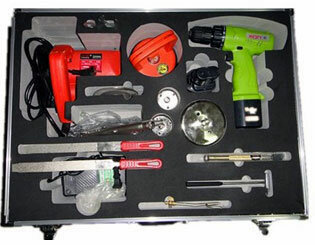 We are a specialized glass breaker tool sets manufacturer in China. At Rescue Group we also offer handheld rebar cutter, hand operated combi-tool, hydraulic ram, double phases motor pump, among others.